The other day I was lucky enough to spend time with family in the Piney woods of Deep East Texas. During that time I made a spear with my cousin Bradley and set off on a short romp around the woods. While Bradley observed the process that was being demonstrated to him for the first time, I couldn't help but think of role that cultural transmission played in forming patterns of stone tool production throughout the archaeological record. The material record, those artifacts measured by archaeologists, are the “hard parts” of culture (Dunnell 1978) and may be seen as the skeletal remains of culture, akin to bones that are the representation of the human phenotype that survive after death. Cultural transmission occurs when knowledge is passed to others. There are multiple modes of transmission. For instance, vertical transmission occurs with parent-offspring teaching. Oblique transmission describes learning, in this case a craft skill, from a non-parent of the older generation. If interested, Stephen Shennan (2009) has compiled a great edited volume on cultural transmission and cultural evolution. In the following study Eerkens and Lipo (2005) focus on the effect of small unintentional changes in the shape of stone points through unbiased transmission from parent to offspring (vertical transmission). In each subsequent generation a 3% error rate in reproduction is added to the length of a projectile point and is then transmitted to the next generation in a Markov chain manner such that change could be simulated over time. The extent of error could be positive or negative for each generation, meaning potentially longer or shorter points from the previous generation could appear. The likelihood for length error will behave in a stochastic manner due to unintentional error during unbiased transmission such that projectile length will have a random probability of distribution. The authors model the process across 400 generations of 10 lineages and allow no interaction or borrowing (horizontal transmission) between traditions of manufacture. Figure adapted from Eerkens and Lipo (2005). 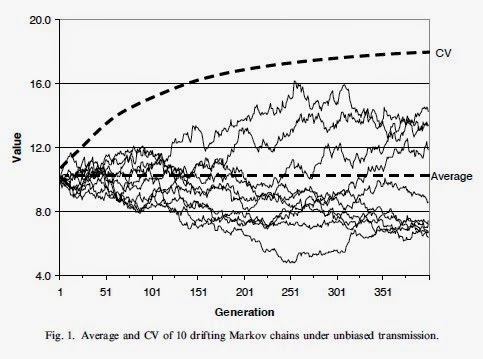 The results (Fig 1) show that simple copying error during cultural transmission may cause traditions of manufacture to drift quite far from the original form and may increase or decrease slightly per generation (Eerkens and Lipo 2005:322). So cheers to oblique transmission, technological innovation and morphological drift! Well done Bradley. Not exactly what we were hunting for, cool to look at though! (1978). Archaeological potential of anthropological and scientific models of functoin. In: Dunnell, R.C., Hall. E.S., (eds. ), Archaeological Essays in Honor of Irving Benjamin Rouse. Mouton, The Hague, pp 41-73. Eerkens, J. W. and C. P. Lipo. (2005). "Cultural transmission, copying errors, and the generation of variation in material culture and the archaeological record." Journal of Anthropological Archaeology 24(4):316-334. (2009). Pattern and Process in Cultural Evolution. In Pattern and Process in Cultural Evolution. S. Shennan (ed.). Univiersity of California Press. Los Angeles. I KNOW this boy thoroughly enjoyed the cultural transmission:) I hear about it daily. Thanks for sharing your time and your blog.